Winter has settled in and simplified everything. 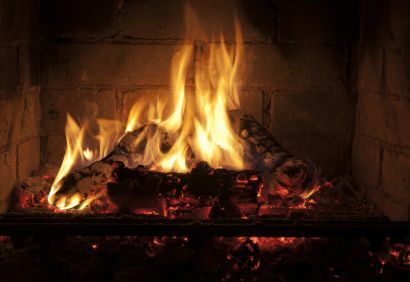 The essentials of life are heat, (quiet heat is nice, but in an old 1838 farmhouse not essential so long as it is warm), food, shelter, and plumbing. The rest is just for show. The life that you tell your girlfriends back home about on the phone or talk about at all those business lunches is mostly fiction. Real life is the reassuring sound of the old boiler chugging back to life every morning. Surely it needs replacing, but the oil tank is underground which is practically illegal now, and so the whole enterprise would turn into a complete renovation and wind up costing about as much as a couple of new cars. Real life is the smell of a steamy cassoulet simmering on the stove. Today we have a winter afternoon of quiet gray light with snow falling on and off. The flakes blow through the branches leaving behind a shiny trail. There is a lovely quiet. The fires are burning and the light from our windows casts a sweet glow on the picket fence which is just another kind of white in a whole a landscape of it highlighted mainly by just the skeletons of the trees. The blurry outline of the chicken house shines with the weird red heat-lamp light that we have come to think of as the Bethlehem light…seen from afar, always burning, ever warm. The boiler came on this morning with a racket, but, thankfully, just the same, it came on. We work hard in the north country for the right to see these mountains every day, breathe this good air, and live this life beside the waterfalls and up close to the coyotes and the bears. We give up restaurants and multiplexes, shiny shoes and good hair salons. But what we get instead are these magnificent views, the smell of woodsmoke and the quiet satisfaction of a life lived on its own terms. Recently we’ve have had these bleak periods with newscasters talking about arctic winds and something called a “polar vortex”. The terms were new to me but the deep meaning of winter surely isn’t. Now is as good a time as any to figure out whatever needs settling. Just like the animals hibernate, humans too can follow these inner seasonal clocks and dig deep. Right now my windows are dirty and there is salt everywhere, even in between the floorboards. The dogs look like scruffy refuges. Outside there is a determined and unrelenting cold. Discord is in the air. But I think the lesson may be that we need to lean in. Who are you? Where do you live? These are important questions. Ask yourself from time to time and watch the answers change. I will be asking too. Because it’s winter and there’s work to do. Love it all! Vermonster here! Uh-oh. does this mean you might be moving somewhere new? “Dig deep…” I like that. Lovely piece. While this does feel a brutal winter, I am enjoying hunkering down. No guilt about staying in on the couch with a book and the fire because I should be cleaning up the garden. Not yet. It’s 4 degrees right now, but later in the morning it’s supposed to be a whopping 10! Most of us, (mother and 2 out of 3 cats) are content to hunker in and jeep warm. Killer, my 11 pound black cat, WANTS OUT and keeps pawing and yowling at me. It’s going to be a long winter. Keep the blog going! Oh my gosh, how exciting that you read my blog! I’m feeling like a celebrity stopped by! My poor husband, I may have deafened him with my squeal of excitement to see you wrote me a note! I hope you weren’t offended about my comment about your planning 🙂 I think its so cool that your family packed up & moved to start a new adventure, especially since I can totally relate. After getting married there, we fell in love with the mountains of Colorado and I would LOVE to move there one day – but don’t know if I’d ever be brave enough to do something like that. I’m glad for you that you are out there living your adventure! Hope all is doing well, are you still in Vermont? Are you getting as battered with cold & snow as we are here in Wisconsin? Thanks again for stopping by, totally made my day!